Fibromatosis: Where are we now? PURPOSE OF THE STUDY: Fibromatosis is a benign but locally aggressive tumour. A high rate of recurrence was noted in a number of patients treated by the senior author at a tumour and sepsis unit despite the fact that a wide surgical excision had been performed. The question was raised whether there are any alternate treatment modalities with a higher success rate available currently. A retrospective study and review of the literature was performed in order to ascertain whether new treatment modalities which can prevent recurrence more successfully have been developed recently. MATERIALS AND METHODS: A retrospective study was performed. The files of all patients who presented at an orthopaedic practice with confirmed fibromatosis on histological examination in the past 19 years were reviewed. The following was looked at: age of the patient at first presentation; gender; tumour site; surgery performed; histological results; first line of treatment and recurrence rate. Patients were also contacted telephonically in order to ascertain whether any recurrence managed by another orthopaedic surgeon had been attended to. RESULTS: We evaluated 17 patients of which eight were males and nine females. The mean age was 25.87 years (range 2-52years). All of the primary sites were extra-abdominal. Median follow up was 3.9 years (0-9) with a mean recurrence rate of 2.3 times. All the patients were treated with a wide marginal surgical excision without adjuvant therapy. CONCLUSION: Fibromatosis has a high recurrence rate using current surgical treatment modalities. Complete surgical excision does not lead to a good outcome. The literature review revealed that a wide variety of treatment modalities, both surgical and non-surgical, are available. Non-surgical treatment modalities include: hormones; non-steroidal anti-inflammatory drugs; chemotherapy; radiotherapy. Wide surgical excision remains the mainstay of treatment but a multidisciplinary approach is necessary in order to optimise the efficacy of this treatment. Fibromatosis is a benign but locally aggressive tumour with a very high rate of recurrence. It has an infiltrative growth pattern which makes complete excision difficult. The National Comprehensive Cancer Network subdivides soft tissue sarcomas into four subdivisions: soft tissue sarcoma of extremity/trunk; retroperitoneal or intraabdominal soft tissue sarcoma; gastrointestinal stromal tumours and desmoid tumours.1-3 We will be focusing on the extra-abdominal division of desmoid tumours. A high rate of recurrence was noted in a number of patients treated at the Pretoria tumour and sepsis unit despite the fact that a wide surgical excision had been performed. The question was raised whether there are more current alternate treatment modalities with a higher success rate. 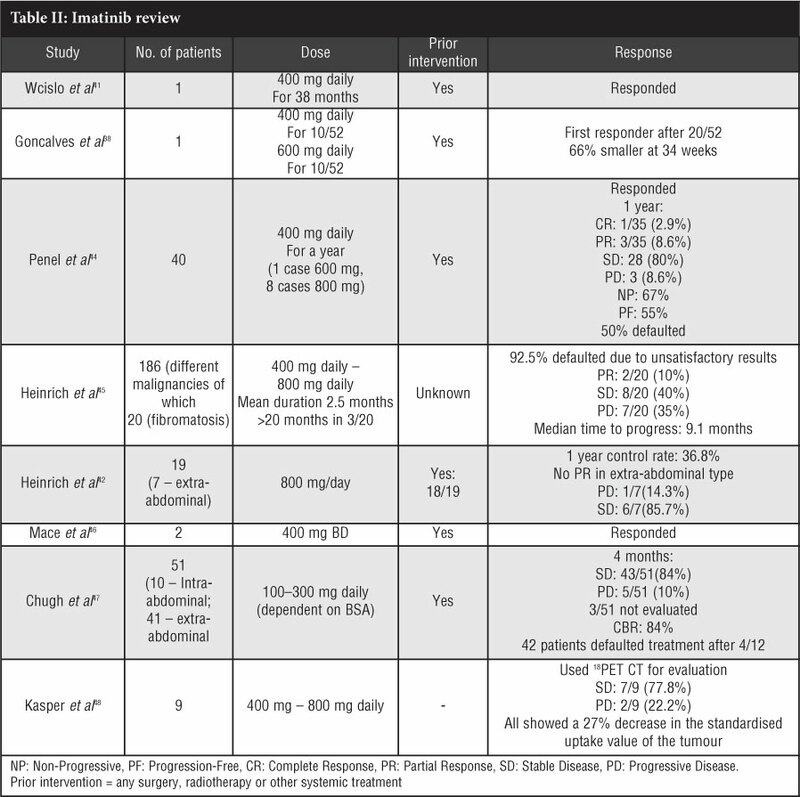 We looked at previously published articles regarding treatment modalities over the past few years and specifically did a review on the new treatment modalities published during the past 5 years. A retrospective study was performed. We evaluated all the patients who presented at the Pretoria tumour and sepsis unit with confirmed fibromatosis on histological examination during the past 19 years. The following was studied: age of the patient at first presentation; gender; tumour site; surgery performed; histological results; first line of treatment and recurrence rate. Patients were furthermore contacted telephonically in order to ascertain whether any recurrence managed by another orthopaedic surgeon had occurred. Seventeen patients were evaluated. Desmoid tumour had to be confirmed histologically in order to be included in this study. One patient had Dupuytren's disease on histology and was excluded from this study. Seven patients were males and nine females (ratio: 0:0.8). The mean age was 25.87 years (range 2- 52years). All of the primary sites were extra abdominal, the highest percentage being on the extremities 62.5% (10/16). Median follow-up was 3.9 years (0-9) with a mean recurrence rate of 2.3 times. All the patients were treated with a wide surgical excision margin. No adjuvant therapy was given. Seven of the patients had complete surgical removal which was confirmed histologically; in all multiple recurrences occurred. The histopathologist was unable to determine the surgical margin in six of the specimens. Only three patients had no recurrence. No genetic screening was done on any of these patients. Wu et al10 did a study on mice and found a correlation between fibromatosis and mesenchymal progenitor cells supporting tumour genesis via the β-catenin pathway. Matono et al11 evaluated 74 samples and came to the conclusion that there is overproduction of the VEGF (vascular endothelial growth factor) in desmoid tumours and especially in the recurrent group. They could not however find any correlation between the 'β-catenin mutation and VEGF mRNA' expression. The exact reason for resolution of the tumour at the 'wait-and-see' principle is unknown and needs further investigation which could help with treatment and even prevention of this disease. The histologist determined the positive or negative surgical margin which we are referring to in this article. It describes the margin of the tumour in the specimen which was resected and evaluated. 'Positive' means tumour at the border of the specimen excised (possible incomplete excision) and 'negative' means a clear, tumour-free surgical margin. Barbier et al12 evaluated 26 cases of extra-abdominal fibromatosis of which 11 had no previous surgery and 15 recurred after surgery. They found that 24 of the cases stabilised at a mean of 14 months; only two regressed and showed evolution at 23 months. They came to the conclusion that a 'wait-and-see' principle can be optimal especially in those with a high risk of severe functional or cosmetic deformities after surgery. A few other smaller studies were also discussed in this article and showed similar results. They suggested that surgery makes the tumour more aggressive. The patient populations in these studies were however small. Stoeckle et al13 evaluated 106 patients over a period of 123 months and came to the conclusion that the tumours stabilised after 3 years and some even regressed thereafter. They suggested a 'wait-and-see' approach and medical management in all tumours except those located primarily in the lower trunk wall/girdle. In the case of these tumours response was more favourable when surgery was performed. Pignatti et al4 evaluated 83 cases and suggested that conservative management can be considered for non-progressive recurrent lesions. A retrospective study done in France by Bonvalot et al14 on 112 patients found a similar event-free survival: 65% versus 68%. The gender, age, tumour size and treatment period were not statistically significant but there was a correlation between the tumour site and quality of surgery with extremity tumours and positive surgical margins having a poorer outcome. A study done by Salas et al15 also found that age, tumour size, tumour site and surgical margins had a significant impact on progression-free survival, and suggested dividing desmoid tumours into prognostic subgroups to decide on management. The above studies suggest that the least invasive method be used as first-line treatment; this however excludes patients with severe pain; a massive tumour or severe loss of function. Each patient still needs to be evaluated individually. Gluck et al16 did a retrospective study and reviewed 95 patients treated at their institute over 24 years with surgery, radiotherapy or both. They found equivalent local control rates in all the groups; no difference between the outcomes of positive or negative surgical margins. They noted a higher recurrence rate (36.8% versus 16.8%) in head and neck tumours versus trunk, extremities, pelvis and retroperitoneal tumours. It is however important to note that the head-and-neck group was very small in relation to the other group (19 patients versus 54 patients). They suggested adjuvant radiotherapy for patients with recurrence after surgery (possibly in positive surgical margins); site of origin - head and neck; and a poor functional outcome after surgery. Melis et al11 published a review on how important a negative surgical margin is and came to a conclusion that you should not resect desmoid tumours due to the consequence of a poor functional outcome in order to achieve a negative surgical margin. In this review it was concluded that treating recurrent lesions with surgical excision and radiotherapy had better results than surgery alone. Gronchi et al18 came to the conclusion after reviewing 203 cases retrospectively (35-year follow-up) that microscopic positive disease does not necessarily affect disease-free outcome in patients with primary lesions but definitely at recurrence. They found that 15% of those patients who presented with a primary lesion were cured even though they had a positive margin on histology. Forty of their patients had adjuvant radiation with a disease-free survival rate of 18% versus 12% at 5 years for those who were not treated with adjuvant radiation therapy. Merchant et al19 evaluated 189 patients of whom 105 complied with their inclusion criteria (with primary lesions) and found that there was no statistically significant difference microscopically between a positive or negative surgical margin with a local recurrence rate of 22% in those with a positive resection margin and 24% in those with a negative resection margin (p=0.51). There was also no difference in the group treated with adjuvant radiation therapy. Seven of the 31 patients (23%) who had radiation developed recurrence versus the 23% (11 of 14 patients) recurrence rate of those who didn't have radiation (p=0.82). Spear et al20 evaluated 101 patients who had surgery alone, radiation therapy alone, or both, and found that they had better local control in those patients with a negative surgical margin as well as those with a positive margin and radiation therapy. Ballo et al21,11 came to the conclusion that radiation therapy is effective in unresectable masses alone or in combination with a positive surgical margin. Tumours with negative surgical margins had a 10-year relapse rate of 21%; positive surgical margins had a relapse rate of 54%; and radiation therapy a relapse rate of 24% with a 15% expected control in those patients who were treated with radiotherapy over the long term. Nuyttens et al23 did a Medline search in 2000 and compared 22 articles. They came to the conclusion that radiotherapy alone or surgery plus radiotherapy had a better outcome than surgery alone. Neoadjuvant radiation therapy has not been proven to have a better outcome.21 Studies are however limited. Intra-operative electron radiotherapy (IOERT) has been studied by Roeder et al.33 They evaluated 30 individualised patients in whom surgical intervention alone would have had severe complications. They had a 3-year local control rate of 82% and concluded that IOERT might be feasible in a multimodal approach. Percutaneous cryoablation in small desmoid tumours have been suggested by Kujak et al.36 They found that this treatment modality appeared to have adequate local control of the tumour as well as pain relief. This was however a retrospective study of only five patients. When reviewing the above and many other studies one can come to the conclusion that surgical margin is a controversial measurement of recurrence. There is furthermore no clear indication as to whether radiation therapy should be administered or not. It does however make sense to give radiation therapy first in those patients with a high possibility of morbidity post-surgery. A multidisciplinary team approach is necessary in order to correctly individualise treatment. The surgeon, oncologist, pathologist and patient must be part of the decision-making team. Systemic therapy has been experimented with for years in order to see if there is a less invasive way of managing desmoid tumours than with surgery and radiation therapy. Some of the systemic treatment options are: cytotoxic agents (anthracyclines); molecular targeted agents: imatinib; and antiestrogen hormonal agents (e.g. tamoxifen, toremifene),interferon and NSAIDs. 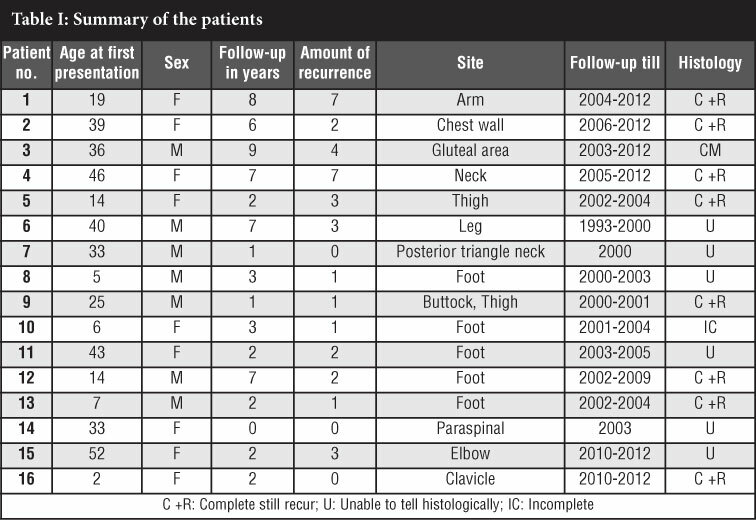 De Camargo et al37 did a retrospective review of 68 patients seen at their institution who received some form of systemic therapy from 1994-2001.The median follow-up was 63 months. They found the following: partial response (PR): 19%; stable disease (SD): 58%; progressive disease (PD) 23%. It was concluded that systemic therapy is an option for patients with debilitating disease. They also noted that anthracyclines and hormonal therapy had a better response rate than dacarbazine/temozolomide or thyrosine kinase inhibitors. This is however a retrospective study over 13 years, the type of treatment and dosages were surgeon-dependent and could have also been influenced by the severity of the disease. The exact mechanism of action for imatinib on a desmoid tumour is still being investigated. There have been a few studies evaluating the target of imatinib, and some of the possible target sites were: PDGFRct, PDGFRp, c-KIT, PDGFct, PDGFp and macrophage colony stimulating factor.38-43 We know it is a tyrosine kinase inhibitor. Table II summarises the studies we evaluated in order to see what the outcome of imatinib in desmoid tumours is. After reviewing the studies in Table II, the following conclusion was reached: there is definitely an indication for imatinib in the treatment of desmoid tumours with stable disease (SD) ranging between 28% and 84% and of progressive disease (PD) of 10%-35%. What was however concerning was the number of patients who defaulted in two of the studies. In the study by Penel et al44 50% of patients defaulted due to: disease progression (9), haematological toxicity (4), refusal of treatment (6), and investigator's decision. Heinrich et al45 had a 92% default rate due unsatisfactory results; this study however included 186 different malignancies with imatinib-sensitive tyrosine kinases or PDGFRa. To date, these are not necessarily the targeting receptor on those tumours.  Outcome of anti-oestrogen therapy in FAP/Gardner's syndrome and desmoid tumour as shown in Table III.  Monotherapy with anti-oestrogen had a significantly higher CR/PR than those treated with anti-oestrogens and NSAIDs.  Tamoxifen and NSAID had a 35% response rate versus 58% in those treated with tamoxifen alone; they however had a higher stabilisation rate. The authors came to the conclusion that this could be biased as more aggressive desmoid tumours might have been treated with combination treatment rather than monotherapy.  Tamoxifen and toremifene are equally effective. Anti-oestrogen treatment is definitely an option for systemic therapy in desmoid tumours. It has fewer side effects than the other systemic drugs and is tolerated better by the patients. Hong et al50 did a study on mice and came to the conclusion that testosterone regulates the β-catenin level and cell proliferation and that anti-testosterone might be effective in the treatment of aggressive fibromatosis. This however needs to be further investigated with a prospective human trial. 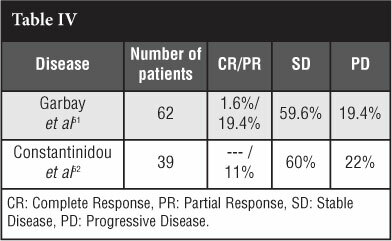 The French Sarcoma Group Garbay et al51 did a retrospective study of 62 patients who had chemotherapy. Forty-four patients had combination chemotherapy and 18 monotherapy of which 13 patients had an anthracycline-containing regimen. They found a higher response rate in the anthracycline group versus the nonanthracycline-containing group: 54% versus 12% (p=0.0011). Forty-eight per cent did not need any other treatment intervention after chemotherapy and the most commonly used regimen was methotrexate-vinblastine. 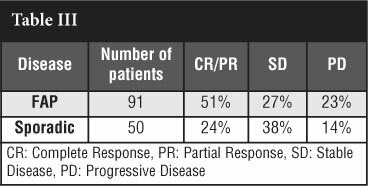 A retrospective study on 39 patients by Constantinidou et al52 found similar results (Table IV). Chemotherapy can have severe side effects such as: mucositis, vomiting, neutropaenia, neurotoxicity, cardiotoxicity (irreversible) and treatment-induced malig-nancy.51,52 Though chemotherapeutic agents are a possibility for the treatment of desmoid tumours, the significant morbidity due to the side effects of this treatment modality have to be considered. The benefit must outweigh the risk. COX-2 is involved in the cell proliferation due to β-catenin stabilisation in desmoid tumours.53 Nishida et al54did a prospective and consecutive case-control trial where they treated 22 patients with meloxicam (10 mg daily) for a median period of 20 months. All the specimens showed a strong positive staining with COX-2 on immunohisto-chemistry. Two patients defaulted due to gastritis, pneumonia or diarrhoea. Of the 20 patients who continued with the study, 95% had a good outcome (stable disease or better) (complete response: 1; partial response: 7, progressive disease: 1; not determined: 2; stable disease: 11). This was however a small prospective study and a bigger randomised trial will be ideal in order to evaluate the above results adequately.  The 'wait-and-see' principle is valid in a patient who is asymptomatic, stable and with non-progressive disease. They have to be followed up closely every 3-6 months to monitor the disease progress. Rather intervene if there is any doubt regarding the disease progression.  Surgery has a high recurrence rate, whether a positive or negative surgical margin is achieved. Radiotherapy in a patient with a positive surgical margin would not necessarily have changed the outcome of our patients. You have to take the side effects of radiation into consideration before exposing your patient to this modality as these side effects will also limit the success of your surgical intervention, if needed, later (e.g. wound breakdown).  Radiation therapy can be considered in patients with large tumours causing functional incapacity, neurovascular involvement or where surgery will cause severe morbidity (unresectable tumour).  Systemic therapy can be given in any recurrent tumour, unresectable tumour, progressive disease or where the least-invasive treatment is to be used as first-line treatment.  Radical surgery for an unresectable tumour is rarely needed and radiotherapy or systemic therapy should be considered first. The most important concept is to individualise each patient and to have a multidisciplinary team approach involving the surgeon, radiation and medical oncologist, pathologist, radiologist, psychologist, occupational therapist, physiotherapist and most importantly the patient's opinion.